The square is lined with wooden huts selling holiday ornaments, and exquisite handmade items to include treasures such as decorations, clothing, children’s toys, candles, soaps, lotions, and mouth-watering treats. 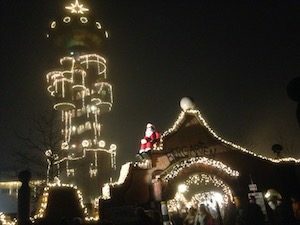 People bundled in winter clothes and wearing smiles beneath sparkling eyes, greet each other with a cheerful, “Gruss Gott.” Seasonal music, live choirs, brass bands, ice-skating and lights. Oh, the beautiful lights create a feeling of wonderment. 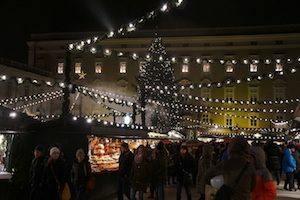 A truly magical experience is found in European winter markets. One of my favorite, yet twisted and macabre, aspects of the European holiday tradition is Krampus. We are all familiar with the story of Santa Claus or St. Nicholas. Well, a centuries-old Germanic tradition adds a special twist by the name of Krampus, an assistant to St. Nicholas meant to terrify children into good behavior. Krampus is a hairy, demonic looking creature with horns and sharp fangs that is adorned with chains, whips or birch branches for beating, and back baskets in which to carry away children. As told by folklore, all naughty children are kidnapped and tortured by Krampus. In reality, this is a seasonal celebration typically occurring on the eve of Saint Nicholas Day, December 6. This includes parades, fun runs, special Krampus appearances at winter markets, and private family parties meant for children. Have I told you yet just how much I love the creepy factor of Europe? The costumes are often customized, and handmade, and completely terrifying. 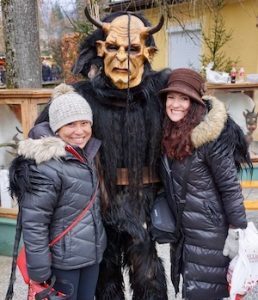 While this is meant to be a fun event and the Krampus are playful with the children, giving them candy and posing for photographs, many children are terrified to the point of tears. As for the adults, the playfulness becomes quite exuberant with actual whippings on the legs and bum with birch branches. Of course, the more one teases and jokes around with the Krampus, the more severe the beating become, but all in the name of fun. 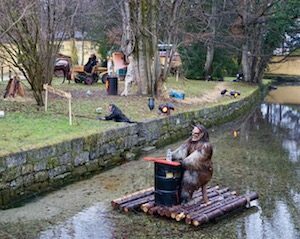 If you find yourself in Germany, Slovenia, Czech Republic, Hungary, or Austria during this time of year and love the holiday season, yet not ready to leave behind the creepiness of Halloween, check out the Krampus festivals at the winter markets. Simply search the internet for your location under “Krampus Festival (insert location)” for a calendar of events to participate in this annual fun event. The medieval castles and Gothic architecture of Europe offer a perfect backdrop for magical fairy tales, scary nightmares, or a little of both.